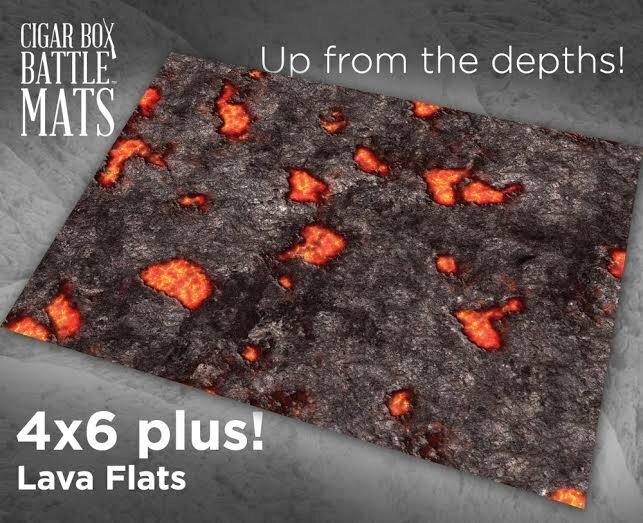 The Lava Flats mat (#360) mat will really bring your favorite sci-fi, fantasy or pulp game to life! It is professionally illustrated and perfect for your troops to fight over for control of the area. It has great lava, surface and rock detail to really help make your game look fantastic! We use this mat for 28mm Sci-fi skirmish (Battle For Zycanthus), 10mm sci-fi, 28mm fantasy ( Hot Frostgrave!) and 28mm Pulp gaming. What would you use it for? It's great for RPG's too! Just add your miniatures, buildings, and some additional terrain and you are ready to play in minutes! Combine several of these mats to create an epic convention or club game!